On Dec. 1, 1941, General Plastics opened its doors to enter the rapidly expanding aerospace industry. Ten years later, our renowned LAST-A-FOAM® flexible and rigid polyurethane foam was introduced to the market. 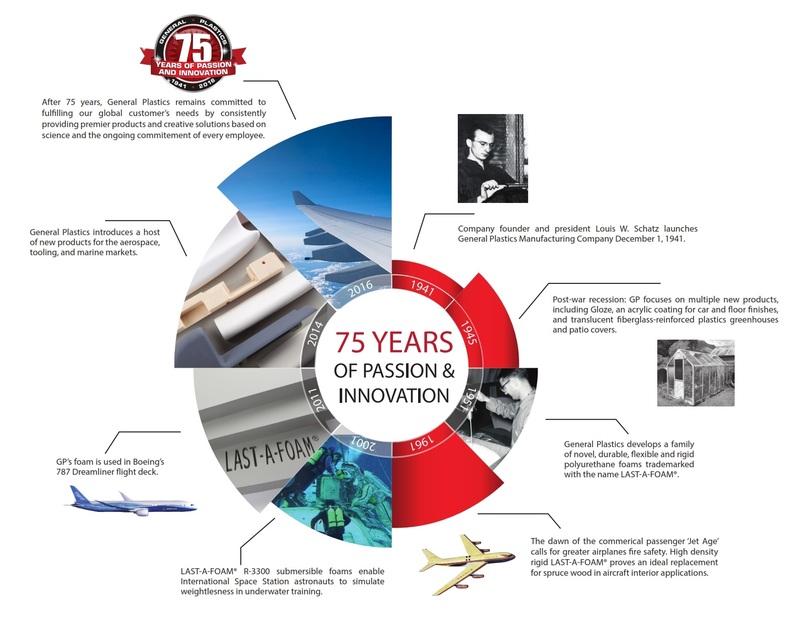 75 years since its inception, we now see General Plastics as a global leader in manufacturing polyurethane foam and build-to-print composite parts, helping customers across a wide range of industries – commercial, industrial, military and composite-manufacturing – providing high-quality materials and effective solutions to attain their goals. Our longevity lies, in part, in our ability to evolve, adapt and innovate, so that we can continue supporting the ever-changing needs of the marketplace. The other side of the equation is having talented and dedicated employees who through the years have made the customer our number one priority.